Seemed to have one of those nights where I couldn’t go to sleep right away, tossed and turned, and then of course decided to wake up early. Well, wasn’t the end of the world because I got to work on some planning for our Thanksgiving adventures when my mom arrives. Spanish was fine. We entered into the subject of immigration and traveling, a subject that can be a tad bit difficult and intense in English, now let’s add an element of fun, speaking Spanish. Excellent. I worked on studying for my three midterms coming up: communication tomorrow, art history Monday, and religion on Tuesday. Received an email about fun Halloween foods to make, as well as a breakdown of the sugar overload in Halloween’s best candies. First off, very excited to make such treats for the holidays in the future and secondly, might try to search out some sugar free options for my Halloween treat. Ok, sugar isn’t the greatest for you for starters, but might as well try to play around the rules sometimes. I certainly enjoyed my candy corn packages, but felt the rush from the delicious and addicting mix of sugar, corn syrup, and artificial flavoring. Something cool I found today was that the History Channel is commemorating the 150 Year anniversary of the Civil War. In doing so, they created a unique interactive website that breaks down all the information about the war, battles, soldiers, and so on. I was fascinated by vast information available in such an accessible format. For all the history geeks like me, it might be worth a moment checking it out. Because I went to the Picasso museum yesterday with my art history class, we did not have class today. Instead, I worked further on studying and was also lucky enough to skype with my friend Sara! Sara is one of my dear friends from La Canada High School and is currently studying in Florence. We both agree that actually living in a city is quite a change of pace from our normal small suburban area in Southern California. Tons of fun hearing what she was up to and just catching up. She also had given me some tips and recommendations for Paris, so I had to give her the low-down on our trip. Funny enough, she gets to visit the city in two weeks! In running club, Josep, one of the teacher leaders decided we were going to run to Ciudadella Park and do intervals. Ooook. When I say I miss cross-country, I don’t mean I miss the sprinting and interval aspect. We did about 10 repeats of 300 km. It basically came out to a 20-minute warm-up, 3-mile workout, and 10-minute cool down. I have to say, even though I complain, it was nice to have someone creating a workout for us, because honestly, there is no way you will find me doing intervals and sprints on my own accord. 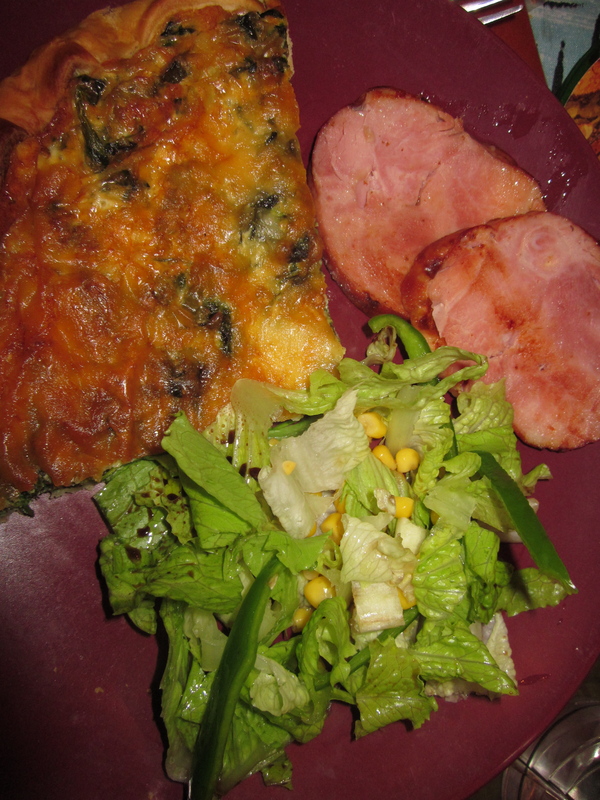 Conchita had prepared dinner early for us, so after I jumped in the shower and threw on jeans and my Barcelona jersey, we sat down to an enormous spinach and cheese quiche, ham, salad, and baguette. I don’t know what it was, but I was starving and the food was delicious. We were supposed to meet Sam at 8:30 but since we started eating dinner at 8:30 that obviously wasn’t going to happen. Ended up walking and meeting up at Pharaohs, where we split sangria de cava and watched the remainder of the first half and entire second half of the FCB game. With a second goal in the 82nd minute by David Villa, Barcelona beat out the Czech Republic team in a Champion’s league match. It probably helped Liz was wearing her Villa jersey. I was wearing mine by Messi and he did have an excellent game. Barcelona is a unique team in that they can have possession of the soccer ball the entire match. They also like to keep the play on the ground, which was excellent for their strategy. Walked Sam to the metro stop, picking up some gelato on the way. Coconut for me on a cone that had a slight ginger taste. Very reminiscent of the holidays. Tomorrow, our “Friday” for the week along with a communications midterm. Probably will take it easy in the morning, just because the legs were not feeling so great after my run today. Didn’t help that I couldn’t spend adequate time stretching or icing.